Life is busy these days, with cell phones, emails, notebooks, sticky notes and every other manner of thing reminding us of things we have to do, people we have to call, errands we have to run, and goals we have to accomplish. What about wonders to witness? For those of you with a bent towards tracking the paranormal, consider keeping a Paranormal Calendar to make sure you don't miss your chance to see a famous ghost or two. What is a Paranormal Calendar? Just what you might suspect, a Paranormal Calendar is a list of reoccurring paranormal events that happen on a routine, and mostly predictable, basis. While ghosts are not known for being the most conscious of time (just ask the victim of a late night pot banging poltergeist who has an early work meeting), there is some precedent for apparitions and hauntings occurring on annual anniversaries. If you are an amateur ghost hunter you would do well to keep a record of local events, both to visit and to study. Collected below are a couple of events that are well known to occur each month of a year; while some may be beyond your current resources to visit for an up close and personal investigation, you can use the calendar to track the internet for reports of others who have experienced them. January 5th is the day that Squire Surtees rides out on his mottled grey, rattling his chains on the driveway of the Tainfeld House in Somerset, England. January 14th is the day one can hear the crying of a woman suicide at the church in Lincolnshire. The following day you can hear the bellows of her husband, who jumped to his death on the 15th, so upset was he. During the cold month of February, on the River Thurne, winter revelers can spot a young drummer boy walking across the ice and hear his forlorn drumming. His was a love forbidden, a rich man's daughter, who witnessed his death when the ice broke beneath him. Mary Queen of Scots is said to haunt the Talbot Hotel in Northhamptonshire. This hotel has the actual staircase from Fotheringay Castle, which is where Mary was executed. If you see a gaunt woman's face staring out the window in February, beware. 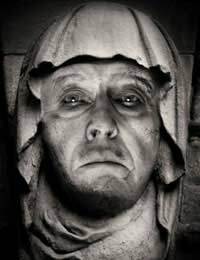 On the 22nd of March watch for a grey, misty figure walking about the Tower of St Johns in Ayr, a warrior of old, or perhaps a friar come to watch his flock. Other ghostly warriors only make the doomed trip to Earth once every four years. On March 29th, 2008, look for them at Alresford at the Cheriton battlefield. You'll think it is the Wild Hunt on the 2nd of April if you are near the Ludham Bridge in Norfolk. A Viking raiding party will appear suddenly late at night and ride for the bridge, eyes and torches ablaze. If you can catch them at the end of the month, every April 30 two statues above the door of the school in Burrough Green come to life and dance. Look for their footsteps the morning after in the village green. Perhaps the result of the Viking Raid from the month prior, on May 1st a Viking Funeral boat, ablaze, can be seen in the South Walsham Broad. The very next night, should you wind up in a church in Burgh St Peter, keep a watchful eye out for Old Nick. The legend says the builder sold his soul to the devil to finish the work, and that his soul still hides from Old Nick in the church. Summer is the time for revelry, and the evening of June 19th visitors of the waters of Lochlee in Glen Esk are treated to the piping of a musician taken her by the wee folk. You may need such bolstering if the following day you visit the church in Tavistock. Any who are there and see themselves in the crowd are doomed to die in the following year. The Duke of Monmouth carries a grisly bundle - his own head - and can be seen on July 16th in the Horton and Woodlands area of Dorset. More bloodshed is to been endured at the Pass of Killiecrankie on July 27th. Here the ground turns blood red on the anniversary of the battle between Jacobite Highlanders and the English. Beware the tall white ghost that reaches for passerby. The first Monday of the month is a time to stay inside and plug your ears should you live near the Pwyllywrach Manor in Wales. It is said that a man was torn asunder by hell hounds, and his torment and cries are relived once a year. From dogs to rats at the end of the month, ghost hunters can see the rat catchers of Beccles leading an army of ghostly vermin to the gates of hell itself. September is a bloody month, indeed. On the 12th the screams of Janet Dalrymple echo in the Bazldoon Castle ruins. Legend has it she went insane on her wedding night, stabbed her newlywed husband, and then expired herself. On the 21st of September more screams can be heard, this time in Gloucestershire. The Berkley Castle is where King Edward the II was murdered, and he wants to tell you all about it every year. October is a naturally creepy month, but this haunting would chill a person any time of the year. On the Audlem Road in Cheshire, heading towards Corbrook Court, a lone man is seen standing on the roadside on October 1st. The figure will stair into passing cars, and can not be seen in the rearview mirror. One can imagine the host of haunting that would occur on October 31st, and one of the more appropriate includes a headless man. The Lesnes Abby is the location of this haunting, where a monk once caught with a woman was beheaded. He returns to the site each year looking for his noggin. On the 29th of November many years ago a sentry fell asleep on the job and was thrown from the battlements of the Folksrath Castle. Each year he returns to make his rounds and his footsteps can be heard. A day later in Romsford, at the site of a long forgotten church that supposedly sunk into the ground, church bells can be heard ringing faintly. December 3rd, 1956, a train wreck killed ninety people in London. Each year on the anniversary of the tragedy the cries of those people can be heard at Lewisham Station. December 19th is the day that Emily walks the ground at Haworth. She is one of the Bronte Sisters, lost in contemplation, returning to the Earth once a year, and vanishing if approached.